RESNET is the industry’s leader in developing home energy rating systems and energy efficient mortgages. 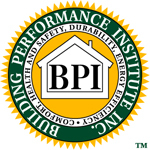 BPI is a leading developer of technical standards for home performance and weatherization retrofit work that are recognized across North America. From these standards, we’ve developed training programs, professional credentialing for individuals and company accreditations – including quality assurance programs – that help raise the bar in home performance contracting. We're committed to making your experience with us a great one. That's one of the reasons that we work so hard to ensure the very best repairs and installations for every one of our clients. When you choose to work with us for your home's needs, you're choosing a company that really cares about delivering a long lasting solution that performs. Contact our HVAC experts in Concord, Walnut Creek, Antioch, Oakley, Pittsburg, Brentwood, Martinez, Pleasant Hill, Alamo, Lafayette, Orinda, Moraga, Pinole, Hercules, El Cerrito, Blackhawk, Berkeley, and Piedmont CA for quality HVAC services.